A few weeks ago, J and I were going to Mason for dinner when we passed what used to be an abandoned building. I always thought it was an old drive thru coffee shop, but the business I found on Google was called Hot ‘N Now Hamburgers. Dig a little deeper and I find Mocha Mac’s which is the coffee shop I was thinking of. It was all lit up and the windows were painted for the first time since we moved here. 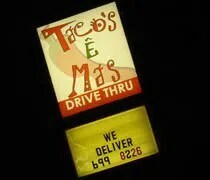 I didn’t catch the name, but Corky pointed out in comments that it was now called Taco’s E Mas. J had made tentative plans to go out with co-workers for dinner which would have left me on my own. I never got around to thinking about dinner. Her plans fell threw and she was now coming home for dinner like she always does. I got up around 5:30 to start on dinner and I just didn’t feel like it. I was tired and not in the mood to cook. I sent her an e-mail to see if tacos would be ok for dinner. She was on board, so we went to check out the new taco stand in Holt. Taco’s E Mas sits on Cedar Street on the way out of town when you’re going to Mason. It’s a small drive thru operation that just opened at the end of November. There was one car at the window when we pulled in a little after seven on a Friday night. We drove around to the back where the first menu board is located. On that board, they only list the eight combo meals. I spotted the taco meal right away and was ready to pull forward. The menu by the speaker had a lot more details about the combos and they included the ala cart and dessert options there. There was no one else in front of us and J wasn’t quite ready so we asked the speaker for a few more minutes. After a couple minutes, J decided on the quesadilla meal. The quesadilla came with cheese, onion, and green peppers. She asked to keep the onion off. The meals also include homemade chips, salsa and a drink. I got the taco meal. The choice are ground beef or chicken and the tacos come with lettuce, tomato, and cheese. I left the tomatoes off. We also got an order of cinn-a-sticks. Once the order was in, the speaker asked if we wanted to upgrade drinks for a few cents more. We said no, but we should have. We pulled around to the window to get the food. The total was just over $11. We realized when our drinks were handed through the window, we should have paid the few cents. The pops were pretty small. In fact, I had finished mine before we even left the drive thru. It did take a few minutes to get our food because they were frying up more cinn-a-sticks so we would have some fresh ones. I definitely appreciate that. When we got home and opened the styrofoam containers, we were both a little surprised. We didn’t pay a whole lot, but we both felt like we got plenty of food. I jumped into the chips first. We asked for hot salsa and it was hot. J said it was too hot and didn’t end up using it. I loved it. You could see chunks of jalapenos including the seeds floating in the mix. My mouth was on fire for quite a while afterwards, but it was worth it. We both liked the chips. They were homemade tortilla chips and not really salty like most people think tortilla chips should be. The tacos were great. The tortilla was kind of a mix between a hard shell and a soft shell. It wasn’t a typical deep fried hard shell, but it still had a little bit of a crunch to it. There was a pretty generous amount of meat and cheese. The meal came with two tacos and that was enough for me. J’s quesadilla was really cheesy. We make quesadilla’s like this at home all the time, but she said these were much better. She really liked the tortilla. Her meal was only one quesadilla, but it was a pretty good size. The cinn-a-sticks were delicious. It was sort of a churro, but not really a churro. I think it might have been more of a deep fried tortilla covered with cinnamon sugar. There was a half dozen or so in the bag and a lot of cinnamon sugar. Surprisingly, we didn’t fight over them. Taco’s E Mas was good. 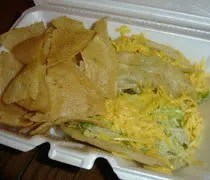 We’re not experts on Mexican food, but we know what we like and we liked Taco’s E Mas. It was good. It was cheap and it was quick. The best thing you can say about any restaurant is that you’d go back and we would go back without hesitation. 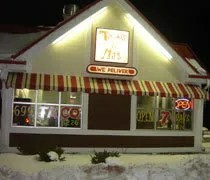 I hate drive thrus and it’d be nice if they’d get some seating, but it wouldn’t stop me from going back some night when I need a good, cheap meal. Loved my first experience but just now had tostada. Only 2 tomato chunks per tostada and I think they cheapened them with velveeta cheese. Disappointed. Love the crunch of the tortilla but with the frozen guacamole i was very disappointed.